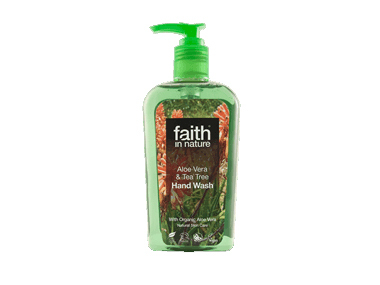 Order Faith in Nature Aloe Vera & Tea Tree Hand Wash from the Online Health Food Store UK. Buy Faith in Nature Aloe Vera & Tea Tree Hand Wash 300ml and other quality Liquid Hand Wash safely online in the UK. Containing active organic Aloe Vera, and blended with Tea Tree for its cleansing and antibacterial qualities. As official Faith in Nature stockist in the UK, we sell quality Liquid Hand Wash to customers throughout the UK in England, Wales, Scotland and Northern-Ireland. Part of the Faith in Nature natural beauty collection and hair care range has been created with natural ingredients to care for you and the environment. Just as nature intended! Made in Britain. View more products on the Online Health Food Store from Faith in Nature. Where to buy Faith in Nature Aloe Vera & Tea Tree Hand Wash safely online? Shop at the Online Health Food Store if you are wondering where you can buy Faith in Nature Aloe Vera & Tea Tree Hand Wash 300ml safely online in the United Kingdom. Our Health Shop is located in the UK and our award-winning independent has been serving customers in England, Wales, Scotland and Northern-Ireland since 1976. You can buy our Natural hair and body care and other quality Liquid Hand Wash online and we post out orders to any UK address. Aloe Vera & Tea Tree Hand Wash - Faith in Nature Aloe Vera & Tea Tree Hand Wash 300ml in Liquid Hand Wash and Hand Soaps.